List of Contributors. Preface. Acknowledgements. The human hypothalamus in metabolic and episodic disorders. Synaptic plasticity mediating Leptin's effect on metabolism. The hypothalamus, hormones and hunger: alterations in human obesity and illness. Glucocorticoids, chronic stress, and obesity. Design and synthesis of (ant)-antagonists that alter appetite and adiposity. Integration of metabolic stimuli in the hypothalamic arcuate nucleus. Adipokines that link obesity and diabetes to the hypothalamus. The circadian modulation of Leptin-controlled bone formation. Hypothalamic thyroid hormone feedback in health and disease. The TRH Neuron: a hypothalamic integrator of energy metabolism. The seventeenth C.U. Ariens Kappers Lecture. An Introduction. Staying awake for dinner: hypothalamic integration of sleep, feeding and circadian rhythms. Circadian timing in health and disease. Circadian time keeping: the daily ups and downs of genes, cells and organisms. The hypothalamic clock and its control of glucose homeostatis. Mechanisms and functions of coupling between sleep and temperature rhythms. What can we learn from seasonal animals about the regulation of energy balance? Organization of circadian functions: interaction with the body. Hypoglycemia in diabetes: pathophysiological mechanisms and diurnal variation. Hypothalamic integration of immune function and metabolism. The prevalence of obesity in developed countries is fast becoming a health issue on par with infectious diseases and malnutrition. Research in this area has grown substantially and includes the neurochemical pathways of the hypothalamus and its role in regulating energy expenditures in the body. 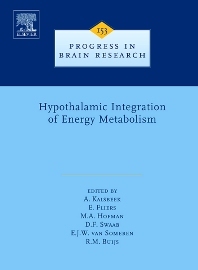 This volume in the Progress in Brain Research series examines the emerging role of the hypothalamus as a crucial link between the sensing of nutrients and the control of insulin sensitivity, glucose uptake, and glucose production, the integrative role of the hypothalamus in thyroid and bone metabolism, the interaction between circadian information and energy metabolism, and the important interplay between the immune system and energy metabolism. Neuroscientists, endocrinologists, and obesity researchers.